The Valley, Riverside and Charleston Catholic softball teams and their coaches gathered for a photograph prior to the final game of Saturday's tripleheader at Neal Field in Gauley Bridge. 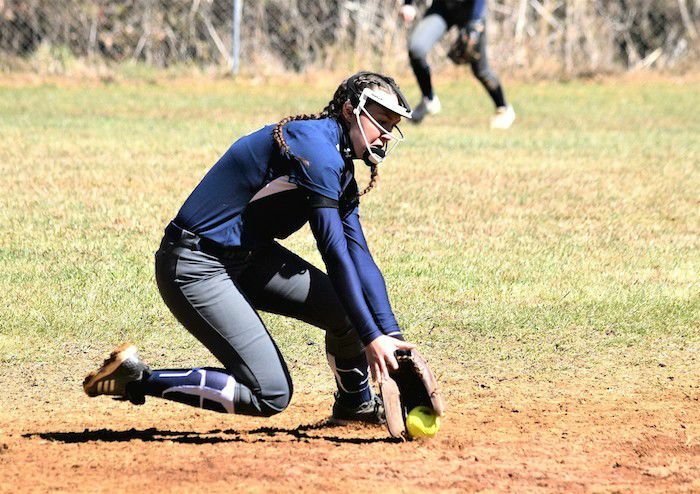 Valley's Gracie Gipson cleanly fields a grounder during a 5-1 win by the Greyhounds over the Riverside Warriors Saturday in the first game of a high school softball tripleheader at Neal Field in Gauley Bridge. Emmie Lopetrone delivers a pitch for the Greyhound girls. Grace Tucker throws a pitch for Riverside against Valley. Valley's Mallory Kincaid got caught in a lengthy run-down between third base and home plate in the first inning against Riverside. Here, Kincaid stays alive on the basepaths while Riverside's Jenna Harper steers her toward home plate. Kincaid eventually escaped and scored the Greyhounds' first run. Riverside's Kate Smallman runs to first base after laying down a bunt against Valley. Looking to make the throw to first is VHS catcher Jayden Chapman. Home plate umpire Danny Thomas prepares to make a call as Riverside's Jasmine Symns eludes the tag of Valley catcher Jayden Chapman to stake Riverside to a 1-0 lead in the top of the first inning Saturday. Valley's Haley Myers slides safely into second base as Riverside's Jenna Harper, left, and Reese Miller unsuccessfully try to get the ball into position for a tag. Riverside's Jenna Harper tags out Valley's Kayla Graves in the fifth inning. Graves, who went 3-for-3 in the opener, was called out when she lifted her foot off the bag after rapping a hard-hit double. Valley infielders Abigail Taylor, left, Gracie Gipson and Brittany Bennett congratulate pitcher Emmie Lopetrone after a strikeout. Katie Huddleston rounds third base Saturday for the 'Hounds. Valley's Kayla Graves prepares to field a throw as Riverside's Kendall Merrell arrives safely at first. Valley's Brittany Bennett catches a throw from Gracie Gipson and steps on second to force Riverside's Sarah Harless. Riverside's Jenna Harper forces Catholic's Kelly Kreitzer at second and throws to first for a potential double play. Backing the play up is Kendall Merrell. Kaylee Blake bunts for Riverside against Valley. VHS head coach Marty Carver gives instructions to a player. Riverside and Valley players — some whom are expected to be teammates next year — mingle Saturday afternoon in Gauley Bridge. Valley and Riverside players go through the handshake line. Umpire Terry Willis watches Riverside's Molly Scites catch a throw to first base. Riverside's Mackenzie Confere delivers a pitch to the plate against Charleston Catholic Saturday. The Warriors captured an 8-1 victory. The Irish's Kelly Kreitzer prepares to score while the Riverside catcher awaits a throw. Preparing to make the call is home plate umpire Danny Thomas. Olivia Corbett pitches for Charleston Catholic against Riverside. Riverside's Emma Pauley smacks a base hit in her team's victory over Charleston Catholic. Kendall Merrell lays down a bunt for the Warriors. Riverside's Emma Pauley arrives safely at third base against Charleston Catholic's Iris Hoyer. Riverside's Kendall Merrell concentrates on an incoming throw to first base. A fly ball eludes Riverside defenders. Valley High School hosted Charleston Catholic and Riverside in a tripleheader Saturday at Neal Field. Valley triumphed in both of its games, defeating Class AAA Riverside 5-1 in the opener, and following that with a 2-1 triumph over Charleston Catholic in the nightcap. Riverside turned back the Irish 8-1 in the middle contest. Kayla Graves was 3-for-3 with a double and a run scored to lead the attack for the Greyhounds over the Warriors. Mallory Kincaid, Haley Myers, Emmie Lopetrone and Katie Huddleston each singled and scored a run. Lopetrone went the distance on the mound, striking out 10 Riverside batters. For the Warriors, Emma Pauley had a single, and Jasmine Symns was hit by a pitch and eventually plated the team's lone run. Weather permitting, Valley (4-2) will host Clay County on Wednesday at 5 p.m. before returning to Scrabble Creek to entertain Fayetteville on Friday at 5:30 p.m.
Riverside will visit Woodrow Wilson on Thursday and Parkersburg on Friday. Jenna Harper registered three hits to pace Riverside to the win in the middle game, and Kaylee Blake added a double for the Warriors. Olivia Corbett led Charleston Catholic with a single and a double. Valley plated a run in the sixth to get past Catholic in the finale. Jayden Chapman led the Greyhounds with two hits, and Kaylee Ryan added a double. For the Irish, Francesca George had three hits, and Olivia Corbett added a double. Valley evened its record at 2-2 Thursday with the 8-3 road victory over Cross Lanes Christian. Valley's 14-hit attack was led by Gracie Gipson, who belted a homer which cleared the fence in the midst of a 2-for-4 effort at the plate. Kayla Graves was 3-for-4, Mallory Kincaid supplied two hits, including a triple, Kaylee Ryan went 2-for-4 with a two-bagger and four RBIs, and Jayden Chapman was 2-for-4. Emmie Lopetrone, Kenzie Duncan and Brittany Bennett provided a single apiece. Lopetrone pitched a six-hitter for the win.